Preparation time: 24 minutes. Baking time: 20 minutes. Prepare a muffin tin by lining 12 muffin cups with papers or by spraying each cup with nonstick cooking spray. Preheat oven to 375° F. In a mixing bowl, combine flours, sugar, baking powder, and baking soda. In a separate mixing bowl, combine buttermilk, oil, and egg, and beat until smooth. Add liquid ingredients to dry ingredients and blend only until dry ingredients are moistened. Fold in apples and raisins. Fill muffin cups about 2/3 full. Bake for approximately 20 minutes until golden brown and done through. 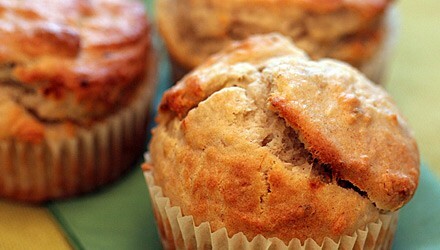 Muffins are done when a toothpick inserted into one or two muffins comes out clean. Exchanges per serving: 1 starch, 1/2 fruit, 1/2 fat. Carbohydrate choices: 1 1/2.